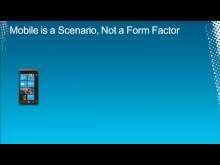 The Mobile Web has been a long time in coming, and now that it’s here, it’s a force that you and your business can’t afford to ignore. What has made all of this possible is the combination of ever-more-powerful devices, fast network connections, and highly capable mobile browsers. 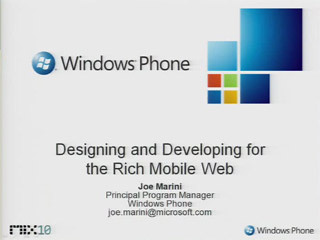 In this session, learn how to build sites that work well and look great on Windows Phone OS 7 and across mobile devices. We cover the core mobile Web scenarios, preparing content for mobile, and tips and techniques for debugging and testing your sites.